STAFDA 2015: New and Improved Products! New Snappy Scaffold System + Other New Products! STAFDA 2015 is here and Granite Industries is setup in Phoenix, Arizona! We have been prepping deals, products and our booth to ensure your time with us is well spent. In this post we will be over viewing the latest products from Granite Industries. The Snappy Scaffold System features packages designed for rental or contractor use. The Snappy System includes 4 different size Snappy utility scaffolds. Snappy Jr. – This 24″ Snappy has all the features of its older siblings but is more compact. Measuring 4 feet long and 24 inches wide, the Snappy Jr can easily be moved from room to room. It can be setup by one person and is perfect for small indoor projects. The highest setting provides 48 inches of clearance from the floor. Snappy Slim (24″) – The Snappy Slim is a bigger version of our Snappy Jr. It is a full 6 foot in length and provides 6 feet of height at the tallest setting. The Snappy Slim is 24 inches wide. This width is very helpful when using the Snappy on stairs. The Snappy design allows the legs to be adjusted independently and still provide a secure scaffold. Snappy’s are commonly used on stairs for this reason. The 24 inches allows people to still use the stairs while the scaffold is being used. Snappy SP-6 (29″) – The standard Snappy is one of the best selling utility scaffolds on the market. The width of 29 inches provides stability and convenience for almost any project. 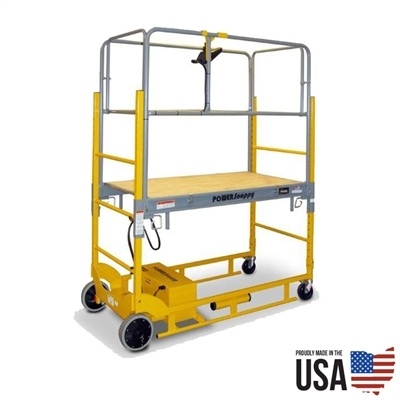 Capable of extending to 6 feet of at it’s tallest setting, the Snappy is very versatile. Snappy Plus (42″) – The Snappy Plus is a beast. A width of 42″ allows for maximum productivity and stability. Two people can easily operate on the Snappy Plus and still have room for equipment. Adjusting to 6 feet, this Snappy is very stable even at maximum height. 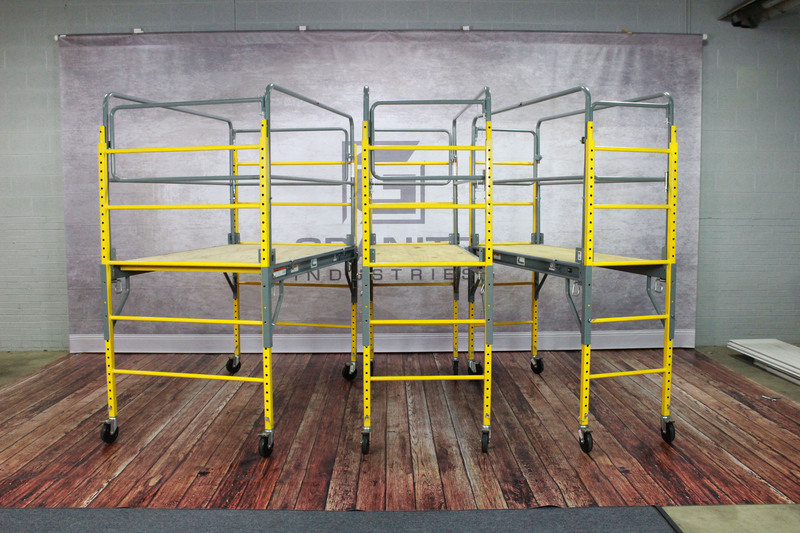 The Snappy SP-6 line of scaffolding features an industry exclusive “Snappy” operation. A spring loaded G-pin allows for quick yet safe adjustments. This leads to quicker and safer height adjustments. Heights range from 27 inches to 6 feet. Add on a guardrail, or double the height with the Double Snappy.